We all know it can be hard to make new friends in a new town. Where do you go to meet people? How do you even start that conversation? Fortunately, as the saying goes, “there’s an app for that.” Maybe it sounds like a corny way to make friends, but they don’t call it “social media” for no reason! Whether you’re new to Flagstaff or have lived here for a while, here’s how to wrangle social media to your friend-making endeavors! Skout is a free app designed to help you meet new people wherever you are. With a simple shake, you can start chatting with someone down the block or around the world! You can set your home town to find folks around you with the same interests, get updates about what’s happening where you live, and more. To be fair, Skout isn’t exactly the perfect “let’s get together” app. (We tried it out and no matter how many times we told it we’re looking for friends in Flagstaff we wound up spending more time talking to folks more than a little out of our zip code.) If you use this app, you will make a friend (or two) in Bangladesh. It’s just kind of a given. But while everyone around you is trying to figure out what to do on another boring weeknight, you’ll be learning how to say “I love making new friends” in Farsi. Sounds worth a shot to us! If you’d like a better shot at making friends where you actually live, try Meetup! Meetup lets you organize, or join in, local events tailored to your interests. Whether you’re a Time Lord, zombie apocalypse prepper, cat lover, or active runner, you can find—or plan—a gathering perfect for you! What’s awesome about this app is it’s designed to give you common interests with the folks you meet. No more awkwardly trying to work Game of Thrones into a conversation when you already know you’re headed to Rendezvous to meet up with your fellow Starks, Tyrells, and Lannisters! If you want finding friends to be a bit more serendipitous, it’s going to be up to you to get out there and join in the social events where your new friends can find you! Our favorite site for finding what’s happening around Flagstaff is Flagstaff365.com! Flagstaff365 is your free social planner; just head to the site to find out what’s going on in the arts, music, sports, and everything in between around Flagstaff! Once you find the events you love, you can “Like” them on Facebook, share them on your social media pages, and even add them to your calendar so you don’t forget to show up! You can even see who else is attending on the event pages, where other folks will share their intention to go, notes about the event itself, and more! It’s a twofer! Apps that let you check in at the various locations you visit are great for tracking your interests and sharing what you’re up to. But they’re also great for going all Little Mermaid on your new city: if you want to be where the people are, Foursquare is one way to do it. The updated Foursquare interface tracks what you like and helps you find places you’ll love around where you live. You can track where your friends have visited, or follow local “influencers” to figure out where your new friends are hiding! 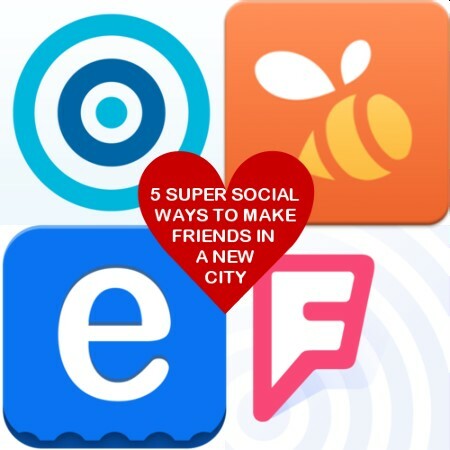 And once you’ve met some cool new people, make sure you connect with them and then get Swarm, a new app from Foursquare that lets you find where your friends are and meet up with them at all your favorite places around town! Let what you already like guide you to events you’ll love with the Eventful app. Available for both iPhone and Android users, this app uses your various music libraries (iTunes, Spotify, and Last.fm) and your interactions with the app to help pinpoint events for you. You can browse the events the app thinks you’ll love or broaden your horizons by checking out the music, movie, and events tabs to see everything happening that day, week, or weekend. Using the events tab, you can tell Eventful what kind of social outing you’re looking for—be it literary, food-based, health, networking, etc.—and have the app pinpoint specific events happening in your town or close by. Find showtimes for the movies you want to see, tickets for the events you want to attend, and more! Bonus: This site won the award for "The Most OMG Friend Finder Tool" we found. It’s called RentAFriend.com, and it’s exactly what you think it is. For just $10 an hour you can actually rent a friend for a party, movie, or whatever else you have going on. While we’re really intrigued by the idea, doesn’t it sound kind of weird to rent people?! On the other hand, reading through their FAQ page gives a better sense of how a site like this could be really beneficial if you’re new in town and want to get out and about. People use RentAFriend.com for things like hiring a city local to give you a tour around town, learning a new skill, or “just looking for someone to give you personal advice.” So maybe it’s not as weird as it sounds … but our jaws definitely dropped when it showed up in our browser! Don't Forget: One easy way to make friends right where you live is by stopping by one of the awesome CARES events at our community! They're fun, free, and a great place to meet new people! Check out your CARES calendar to find the perfect event for you!